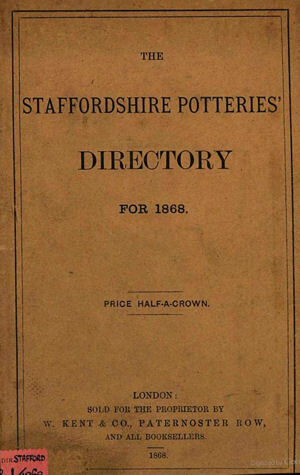 A 1868 directory which gives the names of the potters, addresses and type of ware manufactured in each of the towns which make up the North Staffordshire Potteries. Total number of manufactories was 226. Adams, Wm. & Thos., Greenfield, Tunstall—Earthenware. Adams, Wm., Jan., Newfield, Tunstall — Earthenware. Beech & Hancock, Swan Bank Pottery, Tunstall —Earthenware suitable for Home Trade. Blackhurst & Dunning, High Street, Tunstall- Earthenware. Blackhurst & Co., Sandyford Pottery, Tunstall —Earthenware. Bowers, Fredk. T., Brownhill's Pottery, Tunstall — All kinds of Earthenware and China; London Agent, Thos. Bayley, Hatton Garden. Challinor, Edward, High Street, Tunstall —Earthenware. Clarke, Edward, High Street, Tunstall —Earthenware. Elsmore & Foster, Clay Hills Pottery, Tunstall—Earthenware. Ford, Challinor, & Co., Sandiford Pottery, Tunstall—Earthenware. Hancock, Sampson, Victoria Street, Tunstall—Earthenware. Holdcroft & Wood, George Street, Tunstall—All kinds of Plain and Decorated Earthenware; London Agency, 58, St. Paul's Street, New North Road. Keeling, Anthony, Well Street, Tunstall—Earthenware. Meir, Henry, & Son, Greengates, Tunstall—Earthenware. Oulsnam, W. B., High Street, Tunstall—Earthenware. Turner & Tomkinson, High Street, Tunstall—Earthenware. Wedgwood & Co., Unicorn Pottery, Tunstall—Earthenware. Wood, Edmund T. W., Woodland Street, Tunstall—Earthenware. Alcock, Henry, & Co., Cobridge Works, Burslem—Earthenware. Alcock & Diggory, Hill Top Works, Burslem. Allman, Broughton, & Co. Wedgwood Place, Burslem—Earthenware, General Earthenware for Home and Foreign Markets. Bates, George, & Co., Cobridge. Beech, Jane, Queen Street, Burslem—Toys and Fancy. Bennett, William, Sneyd Pottery, Albert Street, Burslem—Earthenware for General Home use and for Exportation; London Agent, Geo. Marshall, 13, Lime Street, E.C. Bodley, E. P., & Co., Wedgwood Place, Burslem—Earthenware. Boote, T. & R., Waterloo Road, Burslem—Earthenware. Boughton, R. T., & Co., Fountain Place, Burslem—Earthenware. Brough, Joynson, & Co., Bourne's Bank, Burslem—Earthenware. Brownfield, William, Cobridge—Improved Ironstone and Earthenware. Burgess & Leigh, Market Place, Burslem—Earthenware. Cartwright, Thomas, Sneyd Green Pottery, Cobridge— Ironstone, China, Earthenware, Enamelled, Gilt, Bronze Lustre Ware, etc. Cockson, Chetwvnd, & Co., Granite Works, Cobridge—Granite Ware, Table Toilette, Tea and Dessert Services, and Articles adapted for the American Markets. Collinson, Chas., & Co., Fountain Place, Burslem—Chemical and Sanitary Articles. Cork, Edge, & Malkin, Navigation Road, Burslem—Earthenware and Lustre. Corn, W., & Co., Navigation Road, Burslem—Earthenware. Corns, James, Amicable Buildings, Burslem—Creel Steps. Daniel & Cork, Navigation Road, Burslem—Earthenware. Davenport, Wm., & Co., Davenport Street, Burslem—China and Earthenware. Dean & Stokes, Mill Street, Burslem—Earthenware. Edwards & Son, Newcastle Street, Burslem—Earthenware. Elliott & Son, Dale Hall Works, Newcastle Street, Burslem—Earthenware. Evans & Booth, Hamil Road, Burslem—Earthenware. Forrester, John, Podmore Street, Burslem—Earthenware. Furnival & Co., Cobridge — Earthenware. Godwin, John, Sneyd Street, Burslem—Earthenware. Halling, Harden, Wellington Street, Burslem—Creel Steps. Hancock, Whittingham, & Co., Swan Bank Works, Chapel Square, Burslem — Earthenware. Hawthorne, John, Albert Street, Burslem—Earthenware. Heath, Blackhurst, & Co., Hadderidge Pottery, Burslem—Plain and Ornamental Earthenware. Hobson, Charles, Albert Street, Burslem—Earthenware. Holdcroft, Hill, & Mellor, Queen Street, Burslem—Earthenware. Hope & Carter, Fountain Place, Burslem—Earthenware. Hughes, Thomas, Cunard Pottery, Burslem—Granite. Hughes, Elijah, Bleak Hill Pottery, Cobridge — Granite, Printed and Painted, Edged Ware, etc. Lawton, John W, Waterloo Road, Burslem. Lea, Smith, & Boulton, Market Place, Burslem—China and Earthenware. Macintvre, James, & Co., Washington Works, Burslem— Mortice Lock and Bell Lever Furniture, Finger Plates, Shutter Drawer and Door Knobs, Mortars and Pestles, Sign Letters, Garden Labels, Artists' Palettes, Slabs, Colour Tiles, etc. Maddock, John, & Son, Newcastle Street, Burslem—Earthenware. Massey, Nehemiah, Kilncroft, Burslem—Teapots and Figures. Meakin Brothers, Peel Street, Burslem—Earthenware. Pearson, Edward, Sneyd Green, Burslem—Earthenware. Pinder, Bourne, & Co., Nile Street Works, Burslem—Ironstone, China, and Earthenware; London Agency, 17, Gracechurch Street, E.C. Plant & Gardener, Bourne's Bank, Burslem:—Earthenware. Shaw, Anthony, Newport Lane, Burslem—Earthenware. Till & Sons, Liverpool Road, Burslem—China and Earthenware. Vernon, James, Waterloo Road, Burslem—Earthenware. Wallet, John, High Street, Burslem—Teapots and Toys. Wigley, William Henry, Sylvester Square, Burslem—Black and Lustre. Wigley, George, Sylvester Square, Burslem—Creel Steps. Wood, Morgan, & Co., Liverpool Road, Burslem—Earthenware. Allen, H. G., Broad Street, Hanley—China. Ash, George, Broad Street, Hanley—Parian and Majolica. Ashworth, G. L., & Brothers, Broad Street, Hanley—Earthenware. Baddeley, Jas. H., Gloucester Street, Hanley—Rustic Ware. Baguley, George, Broad Street, Hanley—China. Bailey & Bevington, Elm Street, Hanley—Parian. Bamford, John, Nelson Place, Hanley—Jugs and Figures. Bennett & Rathbone, Wharf Lane, Hanley—Earthenware. Bentley, Noah, Bryan Street, Hanley—Parian. Bevington, John, Great York Street, Hanley—Parian. Bevington, J. & T., Marsh Street, Hanley—China and Parian. Brown Westhead, Moore, & Co., Cauldon Place, Hanley—China, Earthenware, Parian, Sanitary and Druggists' Ware; London Office and Show Room, 107, Hatton Garden. Buckley, Jas., Vine Street, Hanley—Sanitary Ware. Buller, W. W., & Co , Eastwood Vale, Hanley. Clementson Brothers, Phoenix Works, Broad Street, Hanley—Earthenware. Cooper, Wm. Thos., Trustees of the late,, Royal Victoria Manufactory (Charles Brock, Manager) Hanley—Every kind of China and Earthenware of Useful and Ornamental Descriptions; London Agent, Mr. John Leslie, Crosby Hall Chambers, E.C. Daniel & Lett, China Works, Shelton, Hanley. Davenport, Banks, & Co., Castle Field Pottery, Etruria, near Stoke-on-Trent— General Earthenware, White Ware, Porous, Antique, and Fancy Goods. Dimmock, John, & Co., Albion Works, Hanley—Stone and Earthenware, Plain and Decorated. Dudson, James, Hanover Street, Hanley—Earthenware and Parian. Evans & Coyne, Brunswick Street, Hanley—China and Earthenware. Ford, Thos. & Chas., Cannon Street, Hanley—China. Ford, Chas., Parker Street, Hanley. Gelson, William, & Co., Hanley. Harding, W. & J., Marsh Street, Hanley—Earthenware. Hodgkinson, Elijah, Mayer Street Works, Hanley—Stone and Parian. Hodgkinson, William, New Street, Hanley—Earthenware and Parian. Holloway, John, Market Street, Hanley—Parian. Howson, George, Paxton Street, Hanley—Sanitary Ware. Livesley, William, Cannon Street, Hanley—Earthenware, Ornamental China Figures, Parian, Statuary, etc. Meakin, J. & G, Eagle Pottery, Hanley—Earthenware. Mills Brothers, George Street, Hanley—Parian. Mills, John, Clough Street— Brown Ware. Old Hall Pottery Company, Limited, Old Hall Street, Hanley—Earthenware, Parian, and China. Oldham, James, Ranelagh Works, Hanley —Earthenware, Mosaic and Ornamental Stoneware, China Door Furniture, Lustre, Parian, etc. ; London Agency, Ely Place, Holborn. Pankhurst, James W., & Co., Old Hall Street, Hanley—White Granite Earthenware. Pointon, William B., Parker Street, Hanley—Earthenware. Powell & Bishop, Miles' Bank and Church Works, Hanley—Earthenware and China, China Figures and Parian Statuary. Ridgway, Edward J., Bedford Works, Hanley—Earthenware. Sale, John, Bryan Street, Hanley— Parian. Smith, John, Hope Street, Hanley—Parian. Stanway, Horne, & Adams, Eastwood Vale, Hanley—Parian. Stubbs, William, Eastwood Pottery, Hanley—Egyptian Black, Stone Ware, Lustre, Figures, Candlesticks, Toys, etc. Taylor, William, Brook Street, Hanley—Earthenware. Taylor Brothers, Market Street, Hanley—Earthenware. Twyford, Christopher, New Street, Hanley—Sanitary Ware. Twyford, Thomas, Bath Street, Hanley—Beer Pump Handles and Spirit Barrels, Water Closets, Blue and Marble Pan Basins, Plug Basins, Blue, Marble, Enamelled, Gilt, Yellow Closets and Traps and Sanitary Ware. Unwin, Holmes, & Worthington, High Street, Hanley—Earthenware. Venables, Henry, Mill Street, Hanley—Porous and Etruscan. Warrington, William, Brewery Street, Hanley—Parian. Wardle, James, William Street, Hanley—Parian and Majolica. Wedgwood, Josiah, & Sons, Etruria Potteries, Stoke-upon-Trent—Earthenware, Stoneware, Chemical Ware, Sanitary Ware, Majolica, Jasper, Parian, etc. Worthington & Son, Brook Street, Hanley—Toilet Ware, Ornamental Figures, Stone Ware, and Coloured Bodies. Close, J. T., Church Street, Stoke-upon-Trent. 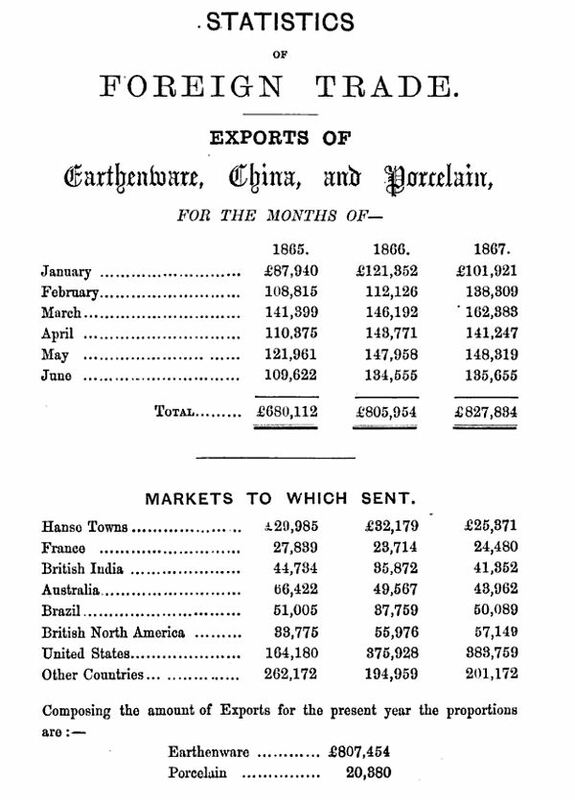 Goss, William Henry, John Street, Stoke-on-Trent—China, Parian Statuettes, etc., Terra Cotta, Fire Clay, and Patent Goods. Grose & Co., Church Street, Stoke-on-Trent—Earthenware. Hill, Leveson, Executors of, Wharf Street, Stoke-on-Trent—Parian. Jones, George, & Co., Trent Pottery, Church Street, Stoke-on-Trent—Earthenware. Kirkham, William, London Road, Stoke-on-Trent —Earthenware, Terra Cotta, Stone Ware Lamps, Chemists' Ware, Boxes, Jars, etc. ; London Agent, 13, Lime Street, E.C. Kirkham, William, North Staffordshire, Brick and Tile Works, Stoke-on-Trent— Plain and Ornamental Tiles, Ridges, Quarries, etc. Minton, Herbert, & Co., Stoke-upon-Trent—China and Earthenware of every Description, Majolica Vases, Flower Pots, Sec., Parian Statuary, Plain and Enamelled Tiles, etc. ; London Agency, 50, Conduit Street, Regent Street, W.
Minton, Hollins, & Co., Stoke-upon-Trent—Encaustic Tiles; London Agency, 50, Conduit Street, Regent Street, W.
Robinson & Leadbeater, Glebe Street, Stoke-on-Trent—Parian Statuary. Turner, Hassall, & Peake, Copeland Street, Stoke-on-Trent—Earthenware, China, and Parian. Baker, W., & Co., High Street, Fenton—Earthenware. Challinor, Edward & Charles, King Street, Fenton—Earthenware. Edwards, John, King Street, Fenton—China and Earthenware. Gimson, Baker, & Challinor, Market Street, Fenton. Green, Mary, & Co., Minerva Works, Park Street, Fenton—China. Hawley & Co., King Street, Fenton—Earthenware. Jackson & Gosling, King Street, Fenton—China. Knight, Joseph, King Street, Fenton—Earthenware. Malkin, Ralph, Park Works, Fenton— Earthenware. Pratt, F. R., & Co., Fenton Potteries—Druggists' Sundries, Terra Cotta, and Uniquely Ornamented Earthenware. Pratt, John, & Co., Park Street, Fenton—Earthenware. Robinson, Hudson, & Co., King Street, Foley, Fenton—China. Wathen, James B., Market Street, Fenton—Earthenware. Wileman, J. & C, Foley Pottery, Fenton—China and Earthenware. Adams, John, The Executors of, Park Place, and Victoria Works, High Street, Longton—China; London Agent, Mr. Samuel Statham, 5, Featherstone Buildings, E.C. Adams, Scrivener, & Co., Sutherland Road, Longton—China, Tea, Breakfast, and Dessert Ware; Ornamental Vases, etc. ; London Agent, Mr. T. E. Small, 17, Ely Place, E.C. Adams & Cooper, High Street, Longton—China. Adderley, Shaw, & Goldstraw, Daisy Bank Works, Longton—Chimney Pots, Etc. Allerton, Chas., & Son, Park Works, High Street, Longton—China and Earthenware, and Gold and Silver Lustres. Aynsley, John, Sutherland Road, Longton—China. Baddeley, William, Drury Works, Longton—Rustic Ware, Terra Cotta, for Floral mid Horticultural Purposes; London Agent, Mr. Saml. Bowen, 83, Farringdon Street, E.C. Baddeley, Elizabeth, Commerce Street, Longton—Rustic Ware and Terra Cotta. Barlow, Thomas, Cyple's Old Pottery, Longton—China. Barlow, T. W., Commerce Street, Longton—Earthenware. Beech, James, & Son, Albert Works, Longton—China, Tea, Breakfast, and Dessert Services, Trinkets, etc. ; London Agent, W. Large, Sen., 9, Hatton Garden. Bentley, Thomas, & Co., Church Street, Longton—China, various. Bettany, Thos., Crown Works, Stafford Street, Longton—-China. Birks, Thomas, High Street, Longton—China, Earthenware, Gold and Silver Lustre. Bold, Henry, Daisy Bank, Longton—Rustic Ware and Terra Cotta. Brammall & Repton, Heathcote Road, Longton—China. Bridgwood, Sampson, & Son, Anchor Works, Sutherland Road, Longton—China and Earthenware. Broadhurst, James, Crown Pottery, Stafford Street, Longton—Earthenware. Brough Brothers, & Co., Gold Street, Longton—Earthenware. Cartledge, John, & Co., Market Street, Longton— China. Cartwright, Moses, Cornhill Passage, Longton—Insulators. Cartwright & Edwards, Russell Street, Longton— Earthen ware. Cheetham, J. R. & F., Chancery Lane, Longton—Earthenware. Cooper & Nixon, Viaduct Works, Longton—Earthenware. W. Copestake Brothers, Anchor Road, Longton—China. Copestake & Allin, High Street, Longton—China. Dawson, James, Commerce Street, Longton—Earthenware. Edwards, Jas., & Son; Market Street, Longton — China. Edwards, Geo., & Co., Cyple's Lane, Longton - China. Elkin, Saml., Stafford Street, Longton—Earthenware. Ferneyhough, John, & Co., Dresden Works, Stafford Street, Longton—China. Finney & Co., Victoria Works, Stafford Street, Longton—China for Home and Export Markets. Gibson & Hallam, St. Martin’s Lane, Longton—China. Grove, R. H., Palissy Works, Chancery Lane, Longton—Rustic Ware, Lustre, China, and Earthenware. Hackney & Co., Daisy Bank, Longton—Parian. Hampson Brothers, New Street, Longton—Earthenware. Hammersley, Freeman, & Co., Prince of Wales' Works, Sutherland Road, Longton— China, Tea, Breakfast, Trinket, and Dessert Services. Hodson, Richard, Chancery Lane, Longton—China. Holdcroft, Joseph, St. Martin's Lane, Longton—Silver Lustre. Holland & Green, Stafford Street, Longton—Earthenware. Hopwood, W., Executors Of The Late, Church Street, Longton—China. Hudden, J. T., Stafford Street, Longton—Earthenware. Hulse, Nixon, & Adderley, Daisy Bank Pottery, Longton—China and Earthenware, White and Decorated, for Home, Colonial, Continental, South American and other Markets. Jones, Frederick, Stafford Street, Longton—Earthenware. Jones, H., & Co., Chadwick Street, Longton—Earthenware. Jones, Shepherd, & Co., Portland Works, Church Street, Longton—Earthenware of all descriptions. Lockett, John, King Street, Longton—China, Earthenware, and Lustre. Lowe & Abberley, Waterloo Works, Longton — Earthenware. Mason, Holt, & Co., Normacott Road, Longton—China. Moore & Son, St. Mary's Works, Longton—China. Page & Dale, Church Street, Longton. Poole, Sutherland, & Hallam, Cornhill Passage, Longton—Gold and Silver Lustre, Parian, etc. Proctor, J. H., & Co., High Street, Longton— Earthenware. Robinson & Son, Wellington Works, Stafford Street, Longton—China. Shepherd & Co., Eagle Works, Stafford Street, Longton—Decorated China and Earthenware. Shepherd & Jones, Church Street, Longton. Smith, Sampson, Sutherland Works, Barker Street, Longton —China and Gold and Silver Lustre. Stubbs, Tomlinson, & Billington, High Street, Longton—China and Parian. Sutherland & Sons, Parkhall Street, Longton—Parian and Tena Cotta. Tams & Lowe, High Street, Longton—Lustre, Egyptian Black, Turquoise, Cain, Sage, and Printed Ware, Stone Mortars, etc. Taylor, William, & Co., Church Street, Longton. Walker, Carter, & Co., Anchor Road, Longton—Earthenware. Webb & Co., Peel Pottery, Stafford Street, Longton—China, all sorts, for Home and Foreign Markets. Webb & Walters, Stafford Street, Longton—Gold and Silver Lustre. Webberley, William, High Street, Longton—China. Williams & Co., Clayton Street, Longton—China. Wood & Co., Mount Pleasant, Longton—China. Yearsley, George, Market Lane, Longton—Parian. Baker & Co., Shelton New Road, Newcastle—Parian. Brough & Son, Silverdale Tileries, Newcastle—Metallic Blue Tiles and Bricks, Facing and Paving Bricks, Roofing, Ridge, and Flooring Tiles, Garden Border, etc. Duckett, Charles, King's Field, Newcastle—Earthenware. North Staffordshire Brick & Tile Company, Limited, Chesterton, near Newcastle— Tiles, Bricks, etc. Trade Directories for The Potteries and Newcastle-under Lyme.